The Ebola Survivors: Reborn But Not Always Embraced : Shots - Health News They have recovered from the deadly virus that is ravaging Guinea. They feel blessed by their good fortune. But family and friends are often afraid to welcome them back with open arms. They call them the "Lazarus" cases, after the Biblical character who died but was revived by Jesus. They are survivors of the latest outbreak of Ebola. Ebola often grabs global headlines as the killer virus that can result in a death rate of up to 90 percent. But in Guinea, the death rate in the current outbreak has been about 60 percent. So there are survivors — to the delight of the overworked doctors, health workers and, of course, the patients who have recovered. "I feel reborn," says a vivacious young woman who chose not to give her name because of the stigma associated with the virus. 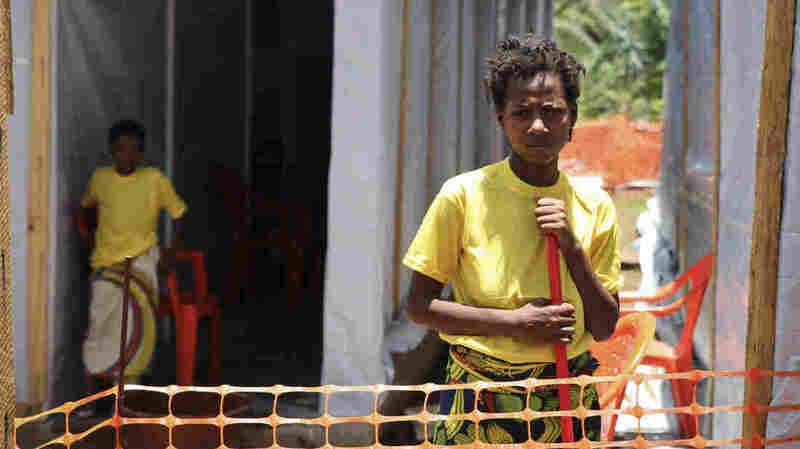 She had tested positive for Ebola and was admitted to the isolation unit in the treatment center run by Doctors Without Borders, a cluster of tents located on the grounds of the main public hospital in Conakry, the capital city. Her face wreathed in a smile, she tells how she went in with a raging fever and other telltale Ebola symptoms: "When I was admitted everyone was saying there's no cure, there's no vaccine, and I was frightened. That alone could kill you." A week later, she was discharged. "I'm out — I've totally recovered, and I thank God and the doctors for helping me," she says. She is one of a handful of patients cleared to go home. The first person to recover from Ebola and be discharged from the hospital in Conakry is a 30-year-old doctor, who also wants to remain anonymous. He was diagnosed after he began feeling unwell and went for a blood test and checkup. Other medical professionals call this slight and reserved man a hero, for helping other Ebola patients in isolation. The recovery of the physician and others has given extra motivation to the medical staff, says Henry Gray, emergency coordinator in Guinea for Doctors Without Borders. "Seeing some of our patients actually survive and walk out under their own steam, it's brilliant," says Gray. "For the patients themselves, they sometimes feel as though they're fighting against all odds, and when they do come through it, there's joy in what is often a sad and difficult place to work." But with survival can come stigma, he warns. "The community must understand that the survivor does not pose a threat," he says. The education falls to the medical team assembled by Doctors Without Borders, which includes local medics and others from the World Health Organization, the local Red Cross and the International Committee of the Red Cross. They all are in close contact with the Ministry of Health as well as political, religious and traditional leaders. "But that is a work in progress," Gray admits. "In Guinea, Ebola is an unknown disease; they're not used to it." The community may think a person is still contagious, says the anonymous doctor who has recovered from the disease. With that fear may come rejection, marginalization and isolation. He was pained to see how close friends shunned his wife and wouldn't eat the food she cooked — or buy the ginger juice she sells. But her physician husband says he understands people's misgivings. Like the majority of Guineans, he and his wife are Muslims. "My wife is very religious," says the doctor, and Islam is a religion of forgiveness in his household. "She has forgiven them," he notes of the nervous acquaintances and neighbors. And now, day by day, the friends are coming back to their house to visit.